This article presents lists of the literary events and publications in 1945. January – In Paris, journalist and poet Robert Brasillach is tried and found guilty of "intelligence with the (German) enemy" during World War II, sparking a major dispute in French society over collaboration and clemency. c. January 1 – Jean-Paul Sartre refuses the Legion of Honour. January 27 – Primo Levi is among those liberated from the Auschwitz concentration camp complex. February – Aleksandr Solzhenitsyn is sentenced to eight years in a labour camp for criticism of Joseph Stalin. February 13–15 – The bombing of Dresden in World War II is witnessed by German Jewish diarist Victor Klemperer, by novelist Kurt Vonnegut as an American prisoner of war, and by Miles Tripp as a British bomb aimer. It will feature in Józef Mackiewicz's novel Sprawa pulkownika Miasojedowa (Colonel Miasoyedov's Case, 1962), Bohumil Hrabal's Ostře sledované vlaky (Closely Observed Trains, 1965) and Vonnegut's Slaughterhouse-Five, or The Children's Crusade: A Duty-Dance with Death (1969). March 4 – Poet Pablo Neruda is elected a Chilean senator and officially joins the Communist Party of Chile four months later. March 8 – Federico García Lorca's play The House of Bernarda Alba, completed just before his assassination in 1936, is first performed, in Buenos Aires. March 31 – Tennessee Williams' semi-autobiographical "memory play" The Glass Menagerie (1944, adapted from a short story) has its Broadway première at the Playhouse Theatre (New York City), starring Laurette Taylor and winning the New York Drama Critics' Circle Award. By about end March – Jack Kerouac and William S. Burroughs complete their mystery novel And the Hippos Were Boiled in Their Tanks, a fictionalisation of manslaughter committed in 1944 by their friend Lucien Carr, but it will not be published in full until 2008. May – Estonian poet Heiti Talvik is deported to Siberia and never heard of again. Expatriate American poet Ezra Pound is arrested by the Italian resistance movement and taken to its headquarters in Chiavari, where he is soon released as being of no interest. On May 5, he turns himself in to the United States Army. He is held in a military detention camp outside Pisa, spending 25 days in an open cage before being given a tent. Here he appears to suffer a nervous breakdown. While in the camp, he drafts The Pisan Cantos. French novelist Colette is the first woman to be admitted to the Académie Goncourt. May 8 – End of World War II in Europe. The occupying powers in Allied-occupied Germany and Austria impose restrictions on publishing as part of denazification. June – Australia's best-known literary hoax takes place when the modernist magazine Angry Penguins is published with poems by the fictitious Ern Malley. Poets James McAuley and Harold Stewart created the verses from lines of other published work and then sent them as the purported work of a recently deceased poet. The hoax is played on Max Harris, at the time a 22-year-old avant garde poet and critic who had started the publication Angry Penguins. Harris and his circle agree that a hitherto completely unknown modernist poet of great merit has come to light in suburban Australia. The Autumn 1944 edition of the magazine with the poems comes out in mid-1945 due to wartime printing delays. An Australian newspaper reveals the hoax within weeks. McAuley and Stewart love early modernist poets, but despise later modernism, especially the well-funded Angry Penguins and Harris's precocious success. c. July – Theatre Workshop is formed in the north of England by Joan Littlewood, Ewan MacColl and other former members of Theatre Union as a touring company. 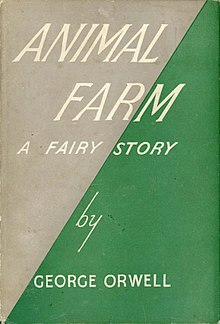 August 17 – The allegorical dystopian novella Animal Farm by George Orwell, a satire on Stalinism, is first published by Fredric Warburg in London. September 11 – The Citizens Theatre opens in Glasgow under this name. October 29 – Vladimir Nabokov's application to become a naturalized citizen of the United States, first made in 1940, is granted. November 1 – The U.S. magazine Ebony appears. November 26 – The U. K. film Brief Encounter is adapted from Noël Coward's short play Still Life. November – Astrid Lindgren's children's book Pippi Långstrump, with illustrations by Ingrid Vang Nyman, is published in Sweden by Rabén & Sjögren, having won a competition run by the publisher for children's books in August. It introduces the anarchic child heroine Pippi Longstocking. An English translation appears as Pippi Longstocking. December 21 – André Malraux is appointed Minister of Information by the new French President, Charles de Gaulle. December – Nag Hammadi library, a collection of Gnostic texts, is discovered in Upper Egypt. ^ Judt, Tony (1992). Past Imperfect. French Intellectuals, 1944–1956. Berkeley: University of California Press. pp. 63–74. ISBN 0-520-07921-3. ^ "The Glass Menagerie". Internet Broadway Database. The Broadway League. Retrieved 2014-12-16. ^ Walsh, John (2008-11-03). "The young generation: Burroughs and Kerouac – an unpublished collaboration". The Independent. London. Retrieved 2015-07-13. ^ Suarez, Michael F.; Woudhuysen, H. R., eds. (2013). The Book: A Global History. Oxford University Press. ISBN 978-0-19-967941-6. ^ Pitzer, Andrea (2013). "Vladimir Nabokov immigration files". The Secret History of Vladimir Nabokov. Retrieved 2015-08-03.